Happy Paddy's Day! This is my most favorite day of the year. I can freely celebrate my culture, enjoy fantastic food, and turn up the craic to 100. It's also my dog's birthday (Happy 12-ish Birthday, Fozzie Bear!). 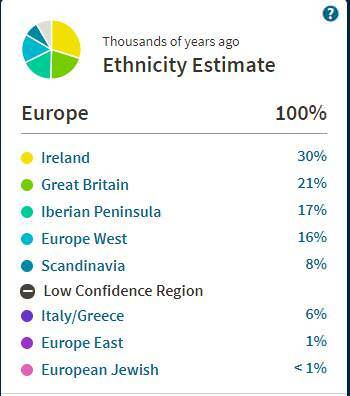 With the knowledge of my DNA and its solidification, I try to take the 17th as a day to be reverent and remember my Irish immigrant ancestors who traversed the Atlantic and onto my hometown of Danbury, Connecticut. Growing up in New England, there's still a proud Irish community and Paddy's Day, while originally about the Saint, is more a day of cultural pride. Unfortunately, outside of New England, things are a bit different. The one thing that I can't deal with much anymore is the number of drunkards that you come across when you go out to celebrate Paddy's Day. I'm slowly discovering more and more as to where I should and should not go to celebrate here. My favorite neighborhood holds a street fest, as there used to be an Irish pub in the vicinity, but I cannot handle it anymore as the only real thing to do is drink. I want to celebrate with music, watching Irish step dancers or traditional Irish music, and eating my fill of the 3 C's - corned beef, cabbage, and colcannon. I don't mind the crowds. I enjoy them, as long as the right atmosphere is present. Even still, for some, the crowds are just too much. I've had some fantastic Paddy's Days going out, but also some great ones staying in. So here, I offer you ways that you can celebrate without having to deal with the raucous crowds. Nearly 1/3 of my heritage belongs to Eireann and I couldn't be prouder. Since starting my genealogy work, I have traced Irish ancestry on my maternal side and started to figure out which counties in Ireland that side may be from. Unfortunately, on my father's side, I'm stuck at a brick wall between immigration to the US and emigration from Ireland. I hope to raise a Baby Guinness to that successful break down in the future. That said, Paddy's Day is an excellent time to start exploring your Irish roots as sites like Ancestry.com and others usually open their Irish records to the public for the weekend. You could, also, consider ordering a DNA test from Ancestry, MyHeritage, or 23andMe to start your journey down the path of your own family history. Another way is to just start chatting with the elders in your family about family history and where your family came from. Anecdotes are an important part of genealogy, as most are not written down in records and you could be the first to share that information. I don't think there's anything that can bring you closer to your culture then the attempt to make its food. I say "attempt" because I didn't inherit the cooking skills that everyone else of my family seems to come by naturally. Going back to New England, I don't think there was ever a year that I ate my corned beef and cabbage at home. My Uncle's Irish Pub was about five minutes away and my cousin would be in the kitchen cooking up a storm. We'd get there, sit down, and within about five to ten minutes, I'd have a plate full of corned beef, cabbage, and potatoes sitting in front of me. It really wasn't until being in Jacksonville that I started having corned beef and cabbage at home. My sister in law would make it in the crockpot, and I would make colcannon to accompany it. Last year, I took over the duties of the entire meal and made corned beef and cabbage in the crockpot and the colcannon. This year, I did all my cooking yesterday (the 16th), so I could be free to do as I wish today. 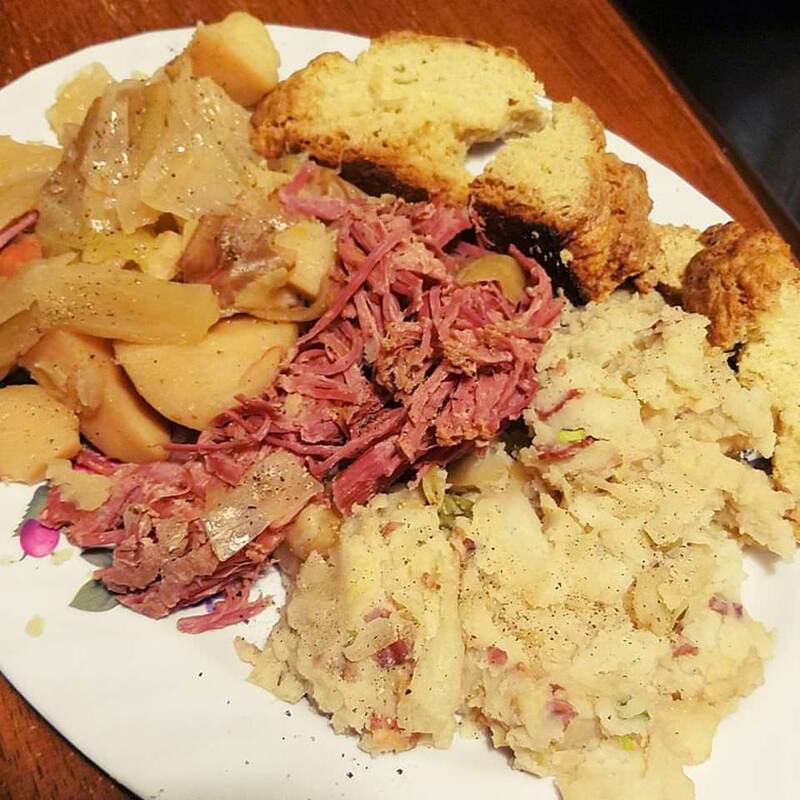 You can see the results of yesterday's cook on the plate above - cabbage with carrots and potatoes, corned beef, colcannon, and, at the top, is my first EVER attempt of soda bread. I'm pretty proud of how it all came out, even if it did take my entire day to cook. Now, I have a whole year to pick something new to cook for next year's meal and remember, your Irish dinner isn't complete without Kerrygold Pure Irish Butter. Another great thing you can do in the days leading up to Paddy's Day, throughout the month of March, or, like me, throughout the year, is to dive into anything and everything about Ireland or created by an Irish author, director, musician, artist, etc. The possibility of finding something you'll enjoy by an Irish creator is pretty great, as the Irish have a finger in almost every pie. I'm very lucky to have an awesome link to the Irish Comic Artist community through friends of mine that I met on a message board years ago. I love seeing when those artists like Declan Shalvey, Eoin Marron (no relation that we know of yet), Stephen Mooney, and others appear in my local comic book store in America. Those same friends, who sparked my love for Irish artists, have an amazing award-winning geek podcast that you should give a listen over at The Irish Pubcast. If you go back far enough in the archives, you may hear me on an episode or two. If the geek side of things isn't for you, there are some other Irish podcasts out there like Irish History Podcast, Maeve in America, and An Irishman Abroad, among many others. In addition to comics and Pubcast, I have a handful of Irish films that you may also enjoy. If you're looking for movies about Irish history or myths/legends, look no further than The Wind That Shakes the Barley, Michael Collins, In the Name of the Father, or The Secret of the Kells. As for my favorite Irish film, I'd have to go with Once. Yes, this is the movie that the musical is based on and which I have yet to see, but I hope to see one day. There are a ton of movies that I have yet to watch and are on my to-watch list (like The Commitments, Sing Street, and Brooklyn), still, but I plan to get around to them. Last, but certainly not least, reading books by Irish authors or about the Irish immigrant experience are a good way to honor this time of year. My TBR (to-be-read) shelf currently includes novels by the insurmountable Maeve Binchy, The Irish Americans: A History by Jay P. Dolan, and Looking for Jimmy: A Search for Irish America by Peter Quinn. You could never go wrong with Ireland's tried-and-true classics (like C.S. Lewis, James Joyce, W.B. Yeats), but you could, instead, look to contemporary and new Irish authors instead. I love a mix of Irish and Irish inspired artists, but I tend to lean towards the traditional and/or reimaginings of traditional songs. I hope to see a good mix of that tomorrow, as I get to go see The Chieftains perform with the Jacksonville Symphony. I'm pretty excited, as it will be my first time seeing them live. I'm always into finding out about new artists, so if you find one that you think I haven't heard of yet, feel free to send the info my way. I lived in Sicily for three years when I was in the Navy. My one goal, while I lived there, was to have taken a trip to Ireland. Unfortunately, situations beyond my control prevented that and hence, I'm still wishing to have seen the Emerald Isle with mine own two eyes. However, all this time of not taking the trip yet has given plenty of time to planning and figuring out what I want to see and do. With the Internet at our fingertips, there's plenty of inspiration to creating our dream trip. You can start by following Irish Instagrammers who, generally, take pictures of the area that surrounds them. A few that I prefer include DublinDiaries, FoxGloveLane, Ronan HD Photography, InstaIreland, Tourism Ireland, Discover Northern Ireland, Inspireland_, and The Wild Atlantic Way. There are a ton more, but I'd be here all day if I listed them all. If you plan out your trip early enough, you can probably catch some decent tickets on Aer Lingus. I popped in dates for late Sept/early Oct and I'm finding round-trip tickets for as low as $690. One of my favorite sites to use to plan day trips, when I lived in Sicily, was Viator.com. The best thing about this website is that it will let you pay in the currency of your own country, instead of having to deal with having to figuring out the Euro to US conversion. In any case, Viator gives you access to attractions, day trips, multi-day trips, and even week-long trips if that is your desire. You can take a look at the Ireland section to get an idea. If pre-planned trips aren't your deal, there are plenty of resources online (Infinite Ireland is wonderful) and books to help guide you. Whenever I visit, I want to see things from the native Dubliner's perspective and not so much of the touristy side, so I'll be reaching out to my Irish friends to take me to some of their favorite pubs and locales. I hope I sparked some creativity for you in one way or another. There is no wrong way to celebrate Paddy's Day, and I hope you celebrate it in the best way for you. Eirinn go Brach! If you're interested in the origin of 5 Fandom Fridays or just want to learn how they came about, head on over to The Nerdy Girlie's Origin Story.